Jackson Hole offers many exciting group activities year-round! The Wort Conference Center’s goal is to provide our guests with an exciting array of options for meetings and events including team-building programs. Our staff will help you plan, organize and implement fun and energizing group activities that will help you create lasting memories of your visit in Jackson Hole. Jackson Hole Mountain Resort is located 20 minutes away from the hotel. We provide a ski shuttle that departs once in the morning and returns in the afternoon. The resort is known for its steep terrain, but they have made an effort to develop more blue terrain over the past few years. Snow King Mountain is another option for those wanting to stay in town. It is located a half mile from the hotel has a mountain coaster, ropes course and a small ski hill. Yellowstone National Park is located an hour away from the hotel. In the winter you can snowmobile into Old Faithful and have lunch at the Snow Lodge and then snowmobile back in a day. You can also go to Old Faithful via a Snow Coach, which is a van with tracks for wheels. The views are stunning and you will see many different animals. Togwotee Pass is also located an hour away and is known for their world-class snowmobile terrain. You can do a half day or full day of snowmobiling on the groomed trails or take your skills to the next level and ride off trail in the powder. You can snowmobile or Dog Sled into Granite Hot Springs. This activity consists of sledding to the hot spings, enjoying a hot lunch, enjoying a dip in the secluded, natural hot springs and then dog sled out. This activity is highly recommeneded by guests and locals alike. Jackson is lucky to have an Elk Refuge just minutes outside of downtown Jackson. This refugee is home to over a 1,000 elk and other various wildlife. You can take an hour long sleigh ride on the refuge and learn all about Jackson Hole and the elk that inhabit the area. If the group is feeling active they can go for a snowshoe trip or snow bike tour in Grand Teton National Park. The park is absolutely breathtaking during every season and should not be missed while touring the area. You can do wildlife tours year-round. They are a great way for a group to see the area and see some of our local wildlife such as elk, moose, deer, bison, bears, and wolves. You could also schedule a photography tour with many companies. In this option, you will be chartered around Jackson Hole and our two national parks in search of wildlife so you could go home with numerous wildlife pictures to enjoy as a memento. Rafting is a very poular summer activity amoung groups. 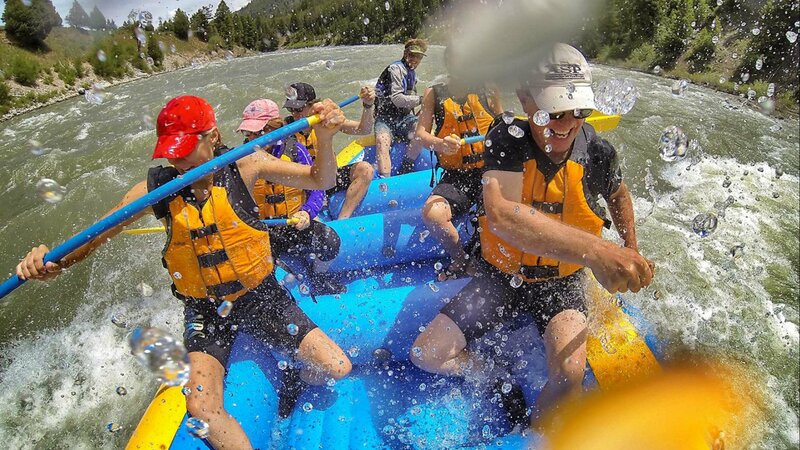 You have the option to do a 8-mile whitewater rafting trip down the Snake River or choose to do a scenic float. A popular option for groups is a sunset scenic float through Grand Teton National Park where you can enjoy wine and cheese while rafting. We have three public golf courses with stunning views of the Teton Mountain Range. All three courses are highly sought after and designed by great names. Jackson Hole Golf and Tennis was designed by Robert Trent Jones Jr., Teton Pines was designed by Arnold Palmer and Ed Seay, and Snake River Sporting Club was designed by Tom Weiskopf. In the summer or winter you can take the tram in Teton Village up to the top of Jackson Hole Mountain Resort. The views are beautiful and you can enjoy a waffle at Corbet’s Cabin which is located at the top of the tram. People enjoy this activity for hiking or simply to enjoy the 360 degree views. Let us customize your group travel experience! Our friendly staff is ready to plan your unique event in Jackson Hole - just give us a few details about your group.